Promotions in ETP Accelerator can be deployed across social media platforms instantly as campaigns. Retailers can connect with their target market through social media such as Facebook or Twitter to promote the brands. Becoming a part of the social media network helps an organization to capture a large audience and establish a direct contact with end-users of the product as well. Posting promotions on social media is a marketing tool to reach your customers online and reignite brand passion and customer loyalty with little upfront cost, which encourages business. 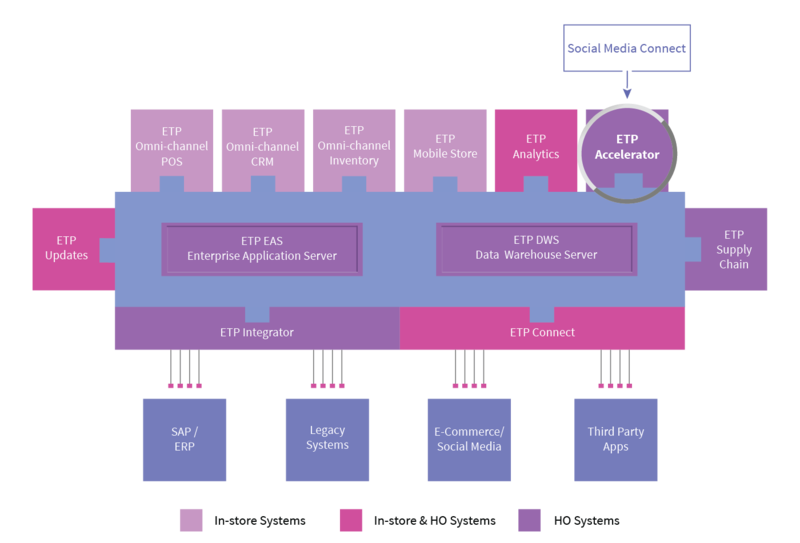 The big advantage of having ETP Accelerator as a tool for publishing promotions on social media is that the consistency of the message across stores, ecommerce and social media is maintained, leading to a holistic customer experience with your brand. The feedback from the social media campaigns can be measured in ETP Accelerator through a tool that lets you know how many people engaged with your posts and updates.